This is an old article from my other older web page site. I was sent a Ten Tec Argonaut from a ham in USA. Problem was low power output and it varied with the band of operation. As the frequency was lower..the output became lower and when the frequency raised up to ten meters the power output was better. — I went through the Argonaut measuring output of the smaller signal stages and then working my way to the output of the PA transistors. Nothing seemed to be wrong so far.. but I traced the signal right to the antenna connection and lo and behold I saw a cracked coupling capacitor that was “trying”to couple the signal to the outside world. I desoldered the capacitor and one leg fell of as in the pictures. 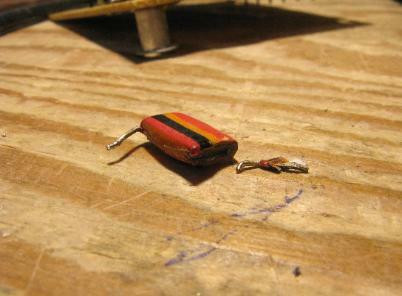 I then soldered in a newer “orange drop”quality capacitor. I then went through the radio and spotted other “tropical fish” (expoxy resin) type capacitors that were on the verge of falling apart. So I replaced them as well. Must have either been a bad batch of capacitors and/or an assembly person who didnt install the capacitors right. Above pictured: the center is the terminal strip that has the coupling capacitor which connects to the center pin of the coax connector. 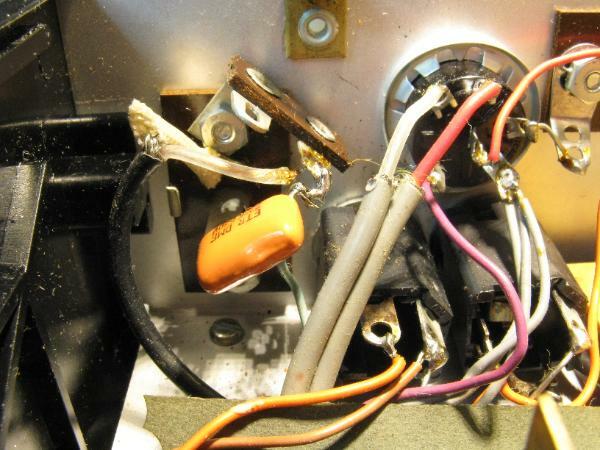 NOTE: quite a few Argonauts have had the simple female RCA phono plug replaced with either a BNC female or an SO-239. 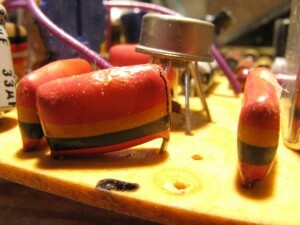 NOTE: the orange drop (epoxy) coated capacitor in place.